Flammable, keep away from fire or flame. Do not use in or contact the eyes. Discontinue use if irritation and redness develop. If condition persist for more than 72 hours consult a physician. If swallowed, get medical help or contact a Poison Control Center immediately. Keep this out of reach of children unless under adult supervision. Open and unfold wipe. Thoroughly wipe hands, fingers and wrists. Be sure to utilize the entire wipe. For dirty hands, use first wipe to clean hands, then discard wipe; sanitize with second wipe. Lot No. and Expiration Date can be found on inside top flap of carton. 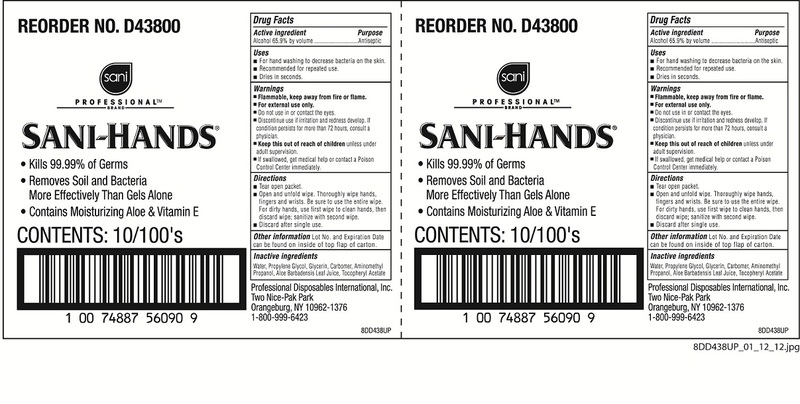 For dirty hand, use first wipe to clean hands, then discard wipe; sanitize with second wipe. Discard after single use.